On Fridays at Hashtag 59 our blog topic will be centered around "Adventure Destinations!" After all the weekend is here and it's a chance for you to maybe have some more time to cut loose. Today’s post is about one of my favorite adventure destinations in the world: Moab, Utah! For those of you unfamiliar with this area Moab is a playground set in the Red Rock desert. If you are seeking fun and adventure then Moab is a place not to pass up. In my opinion it is the best collection of adventure opportunities and explorations in a concentrated region in the entire lower 48 states of America and tops in the world with other heavy hitting big boys like Alaska, Iceland, and New Zealand. Moab is a four hour drive from Salt Lake City or about an hour from Grand Junction Colorado if you can find a flight into there. From high end resorts to beautiful AirBnB’s (which is what we just did, Jenna’s place can be found HERE and was perfect) to camping in the National Parks or RV resorts Moab has a little bit of everything in terms of accommodations. 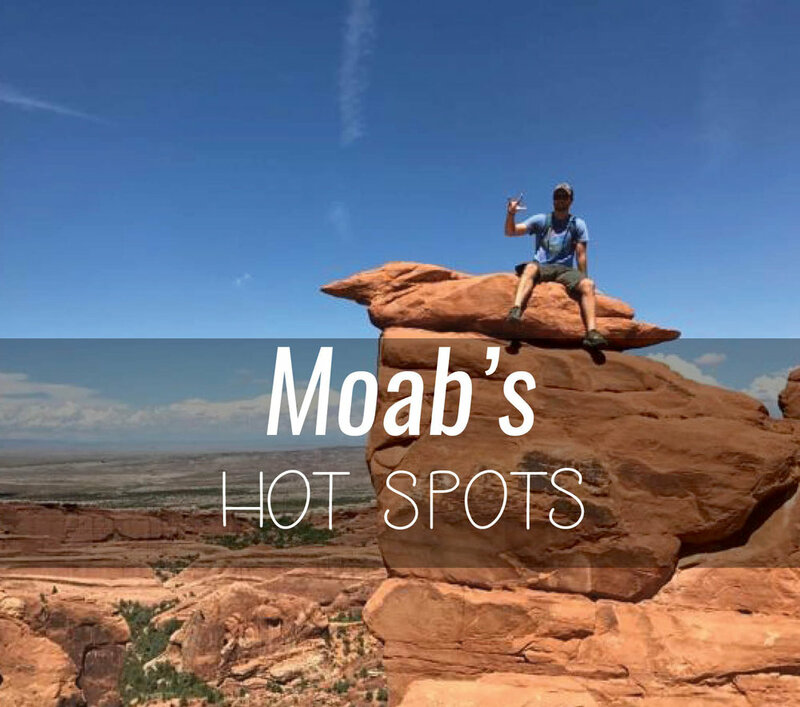 Here are six things that I have done in Moab and its surrounding area that I would recommend get to happen on your first visit there! It’s too close and too awesome to not visit. This iconic park is currently my 6th favorite National Park that I have visited (out of 30). If you have never been to Arches plan for at least two days here. The scenic drive will make you feel like you have landed on Mars and recommended day hikes are the Devils Garden Loop up to Double O Arch and seeing about 7 arches along the route, Delicate Arch (the iconic Utah license plate), Park Avenue, and a stroll through the Windows Section. Combined with adding a ranger tour through the fiery furnace section and a stop at the visitors center and some good picnicking you’ll have two full days if you take all of this on. Arches is HOT in the summer. My finger tips were soaking with sweat as I marched up to Delicate Arch last week. Bring lots of water. These hikes are not all for beginners either. You get to follow rock cairns up steep slick rock for both the Devils Garden Loop and Delicate Arch. But both of these are two of the best day hikes in the lower 48 states. Arches has a $25.00 entry free for a week and two days there will make you feel sore and mesmerized of its beauty. Needed time: two full days. Well all that hiking fun gets to come with a little celebration after a long day! While Utah is filled with unordinary liquor laws when compared to the other 49 states Moab Brewery is just like anywhere else. Their canned IPA’s are outstanding and the food is tasty as well. Memorial Day Weekend brings a music and craft brew fest that they lead that is a wonderful time to sample all of their tasty hopes and ales. There are a number of other great mexican restaurants, breakfast spots, and coffee shops for the bean lovers! Needed time: One night and two nights if you are wild and young. Bike paths dominate Moab. Whether you are an experienced mountain biker and want to take on the Slickrock Trail (one of the most famous and hardest mountain bike trails in the world) or you are just ready to petal through town and out through Lions Park and up to the amazing scenic drive on Highway 128 the mountain air and beautiful views will make your sore legs feel like nothing even happened. There are several bike rental places in town. Needed time: Half day minimum. Raven’s Rim Zipline is a perfect 2.5 hour tour that combines multiple fun ways to really experience Moab and the surrounding area. Located right in town you get a fun 40 minute 4WD off roading adventure, six amazing zip lines complete with running starts, fun and engaging tour guides who share stories of the area, a bouncy drawbridge walk over a mini canyon, and a story and experience you won’t soon forget! Needed time: Allow four hours. We took a canoe 11 miles down the Colorado River to this small and rural campsite. After that gorgeous paddle we let out at Gold Bar which has a route up to Corona Arch and Bowtie Arch. I know you might think you have seen enough Arches but these are special, it’s a tough but outstanding four mile roundtrip hike, and then you get the fun of cooling off in the Colorado River. Pack a cooler for a picnic and then watch rock climbers do their thing at Gold Bar and head back to Moab. We used Moab Rafting and Canoe Company and they were great. Needed time: Half day to two days with overnight stay. 127 Hours the movie happened in Canyonlands and Thelma and Louise’s infamous cliff jump was actually filmed at Dead Horse. Both of these places are an hour from Moab and you can choose to spend a day exploring and get lost in the wilderness for multiple days here. The areas are huge and vast and experiences range from day hikes to rafting trips to Jeep tours. Canyonlands is really just as amazing as Arches but since it’s 35 miles away from Moab instead of 5 miles it has 10% of the visitors. Canyonlands also has two jump off points from Moab. Island in the Sky is right by Dead Horse but if you have a second day you can explore the Needles region which is about 90 minutes from Moab. I have not spent as much time as I should in these place and my next trip to Moab will be centered around more energy around these areas. Needed time: One full day to multi days. That’s my top six for Moab. If you have 7 days you’ll have plenty of time to relax and knock off all six on this list. Here’s the deal about Moab and traveling in these National Parks in my eyes. It’s about the people you meet along the way, the journey instead of the destination, and what you learn about your life and who you can be in this world as a result of stretching yourself out into this wild world. It’s also about having some fun. Moab has wonderful people, we made many new friends on our recent trip, and it allows you to turn this land into a playground to cultivate whatever it is you need to get out of it. Don’t worry if you miss something or there’s a delay or change of plans. Everything happens for a reason and if you let the Moab lifestyle overtake you it doesn’t matter if you hit all six of these items on this list, just one, or none of them. Moab will take your breath away and leave you filled with love of this planet, gratitude for life, and an excitement for your next adventure back to this Desert Playground! Visit DiscoverMoab.com for other great insights and details. They have been a huge help in the planning of my trips there. Don’t forget you win an official framed Hashtag 59 print (mailed directly to your house) by joining our newsletter! You will automatically be entered in our quarterly giveaway. We'll be back on International Mondays with a post from Amy! Have a great weekend all!